3rd conference of i3 Season 3 in Bangalore was awesome. We had Ms. Shruti Balasa as the Counsellor of the day. She is the Chief Web Designer of iUeMagazine, adad and many more websites. No doubt that we were very lucky to have a Counsellor like Shruti Balasa ma'am and the delegates were very curious to listen to the Counsellor's speech. * Everyone should work hard to achieve one’s goals. * Set a target, no matter what it is. * Until you try you won't get an idea. * Entrepreneurship is not only investment of money. Actually, it is the Investment of time and dedication. * Be passionate about your Dream. * Just determination and passion can raise you from the ground to peak levels. * Never care for what others say and be firm on your decision to follow what you need to. * Never give up opportunities because you never know if you will get them again. Give a try for everything because, at the end, whether you fail or succeed both give you immense experience. * Work every day to be better than the previous day because one day if you ever turn back you will be happy for what you are. 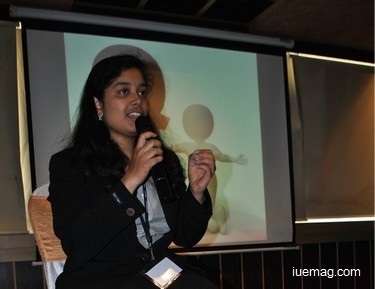 I thank Shruti Balasa ma'am for inspiring the delegates and for sharing lessons on entrepreneurship and success.